Cleaning. What a pain. It would be so much easier if it wasn't my stuff. I could just shovel it all up, fill trash bags, and toss it out. But it's all my own crap that i kept for some reason or other. Now I have to go through, examine each item and determine if it has reached it's expiration date of usefulness and sentimental value. Old birthday cards, blurry pictures, obituaries, news paper clippings, those are the tough things to sort through. So I decided to tackle one shelf stuffed full of old magazines. Here's some of what I found. Art? Alternative - "Bizarre, Abnormal, Weird, and Other Wonderfully Strange Stuff." It featured surreal art from the likes of Robert Williams, The Pizz, and Sandow Birk. Subliminal Tattoos - "Art, Media, Behavior, Obscure Culture." Like Art? Alternative with less color and more words. Included music and zine reviews (zine's are now called "blogs without the dead trees,") interview with folks like Dana Crumb (R. Crumb's ex,) and plenty of illustrations from artists like Matt Feazell. Adbusters - "Journal of the Mental Environment." It's still around, and a great place to find inspiration, for ads. Brill's Content - "The Independent Voice of the Information Age." I have the complete set of this Steve Brill work. Consumer Reports - "Expert, Independent, Nonprofit." Easy call here, they're out dated and I can just check the amazon reviews. The Empty Vessel - "The Journal of Daoism Philosophy and Practice." I still pick it up a Barnes and Nobles from time to time, in case electricity goes away. Chaparral - "1999"? It's Midland College's annual magazine. I didn't attend class there but a photo of mine was printed in it. So it's a must save. And it also features a piece by Staci Lumby. Dog Fancy - Gone. I don't have a dog, and they don't have a website. Newsweek - "The Year in Cartoons." They're online now. Wild Cartoon Kingdom - This copy is online, but I think I'll hang on to it anyway. Reptiles USA - Right up there with Dog Fancy. My reptile is dead and so is there web presents. Yahoo! - "Internet Life." When the world was on dial-up, they had to kill trees to bring internet into your home. The first of two publications be Ziff Davis. And here's the second. Internet Underground - "Hackers, Smugglers and Cheaters, Oh My." Because the internet was slower than ink drying on paper. Cigar Aficionado - They're going up in smoke, too. Maybe not the trash, they may be better suited for the men's restroom at work. 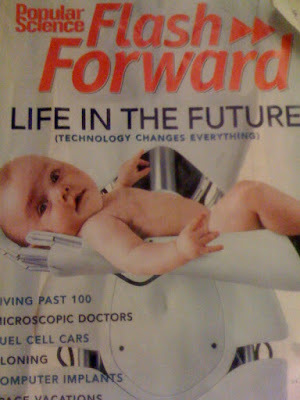 My favorite find was the Popular Science, Flash Forward from 2001. It tells of a day when your PDA will also play MP3's and connect to the internet via a Bluetooth radio signal to your cell phone. Stick the cell phone in the PDA/MP3 player and you have the iPhone. The car of the future would take after Honda's new 70mpg Insight (not like 40mpg Insight of 2010.) And they said nothing about the 2000's Hummer craze. I also turned up a few bonus items in the mag stack. 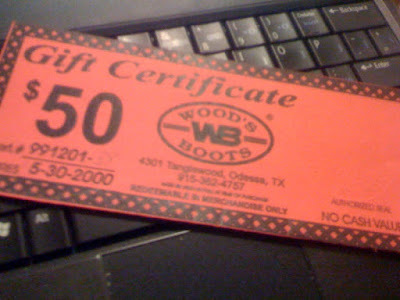 A $50 gift certificate to Wood's Boots that expired in 2000. And a phone list from Big 2. I use to work there, but I don't now. Your loss Big 2, no mid 90's Cigar Aficionado magazines for your men's restroom.